Lee's Summit North Broncos Great State Meet! Lee's Summit North has been one of the strongest teams in the Kansas City Metro area. The Broncos have been strong since they were established in the mid-1990s. The former head coach is now a Hall of Famer for his efforts. Current coach Davis had huge shoes to fill but, this year's season-long results have proven the program is in great hands. As a sprint guy, I was most impressed with their system-wide crazy fast relays all season long. I am one track fan looking forward to their sustained progress. Coach, a great way to finish the season is winning a top four trophy. How do you feel about the outcome? We are really pleased with how the season ended. Our coaching staff couldn't have asked for more from the kids, some exceeded our expectations. Great weekend for Lee's Summit North. We made winning a trophy this year a priority from the beginning. We looked at what we had coming back from last year and saw what potential was there in the sprints, jumps and middle distance and believed that was a realistic goal for our team. Throughout the course of the season, we kept coming back to that, measuring our progress and standing against the rest of the state (thanks MOMileSplit!) and as the season continued, the possibility of a trophy became more real for the kids. Our training plan was always built around a big push the last two weeks of the season to accomplish that goal. The turning point was Friday night, back at the hotel. During the day, I felt like things were somewhat slipping away, we didn't look sharp, the morale of the team was actually kind of low because they weren't running great times, something that they had done in previous weeks. After we ate dinner and had our team meeting, the coaching staff met with each of our athletes individually for about 5 minutes to assess how things had gone with them during prelims and then we focused on what they needed to do the next day in finals. The kids all seemed to respond well to that, I think it made them each feel valued and important to the whole team effort. I'll definitely do that again in the future. Nyles Thomas had the standout performance for our team with his presence on the 4x1 and 4x2 but he came through big in the 100 and 200, placing much higher than expected in both of those races. Todd Pinkowski was huge for us as well, winning the 400, as a first-year guy. He still doesn't really understand all of this track and field stuff so him just trusting his preparation and going out and running a really gutty race was a huge breakthrough for him. 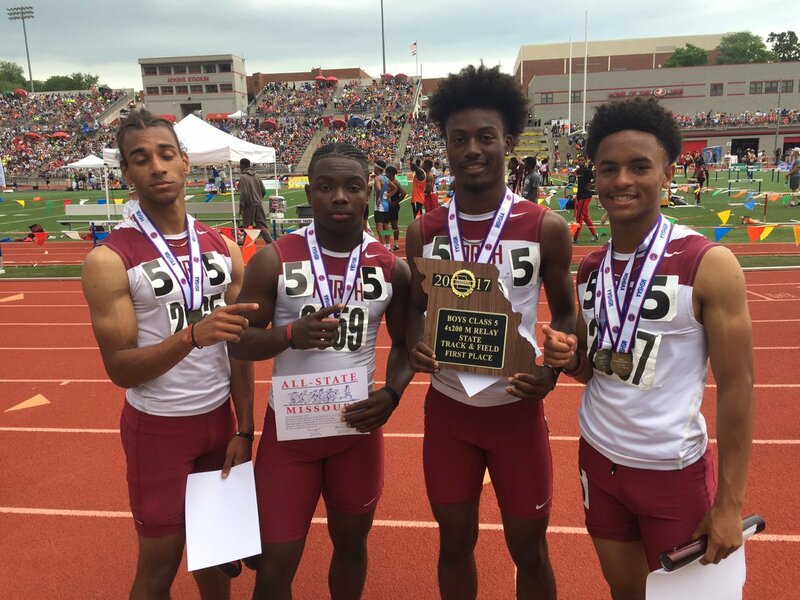 This was the first time in school history we had won the 4x2 or the 400 meters. We also had never had one athlete (Nyles Thomas) place in both of the short sprints. Him being a sophomore this season, that's exciting! I think they handled it extremely well. That break in the afternoon could have been devastating psychologically, but we went to Applebee's, relaxed, ate some food that most nutritionists would never recommend for athletes and they came back and took care of business and I think part of what helped that is that we have a young team, they didn't know any better. And secondly, we as a coaching staff didn't get worked up about it (at least we didn't let them know) and we just carried ourselves like it was no big deal. 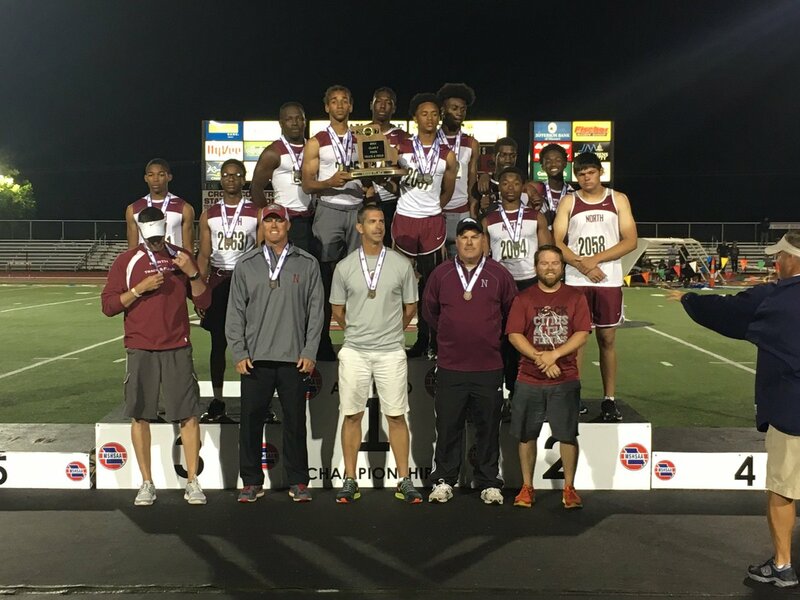 I think we do a great job with the awards at the state meet, that has been much improved over the past few years and I like the move to Jefferson City High School, even if its a little crowded walking around in the stands. It is so much more efficient from a logistics point of view, more compact layout with tent city and all of the event sites. One thing that I think would enhance the meet so much is (an expensive) a video screen with replays or live coverage of field events going on. We've always really enjoyed running at Pitt State in the past because they have a huge video screen and they have two or three cameras covering the races and field events going on, they even do replays in slow motion. Pretty cool...that's a big wish for the future.